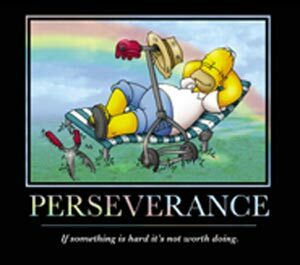 Simpsons T-shirt: Homer Simpson Funny Parody Tee "Perseverance"
Motivational poster parody t-shirt: Homer Simpson relaxing on a reclining lawn chair. His glove and hat are on the lawn mower. And, of course, cobwebs are starting to grow on the mower. Wording at the bottom states: "If something is hard, it's not worth doing." Vibrant, high-definition silk screen art work printed on 100% cotton, pre-shrunk, black tee. Only adult size Medium left in stock. Motivational poster parody t-shirt: Homer Simpson relaxing on a reclining lawn chair. His glove and hat are on the lawn mower. And, of course, cobwebs are starting to grow on the mower. Wording at the bottom states: "If something is hard, it's not worth doing." Vibrant, high-definition silk screen art work printed on 100% cotton, pre-shrunk, black tee.